The Laffer Curve is named after economist Arthur Laffer, who was an advisor to President Reagan in the early 1980s. The principle behind the Laffer Curve is that as taxes in the economy imposed by the government increase from fairly low levels, tax revenue received by the government would also increase. However, as tax rates rise, there would come a point where people would not regard it as worth working so hard. This would lead to a fall in income and therefore also in a fall in tax revenue. The logical end-point in the Laffer Curve is with tax rates at 100%. At this point, people would not work at all and tax revenue would become zero. The Laffer Curve theory claims that there is a single maximum, point where the tax return is maximalized, and the further you move in either direction from this point, the tax revenue will decrease. If the income tax level is set below the optimal level, raising taxes will increase tax revenue. And if the income tax level is set above the optimal level, then lowering taxes will increase tax revenue. According to research by Nobel laureate Edward Prescott and by economists Steven Davis and Magnus Henrekson, the high tax rates in Europe in the past decade have reduced work effort and distorted the industrial mix. Higher tax rates also reduce the size of the tax base in a way that people respond to higher tax rates by finding a ways to report less taxable income. However, many economists also claim that the Laffer Curve does not work and is a mere hypothetical approximation. The Laffer Curve is some times called a taxable income elasticity curve. More economics: What is Robin Hood Index? 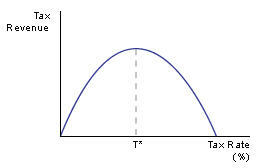 More economics: What is Lorenz curve?